This is an interesting graphic. 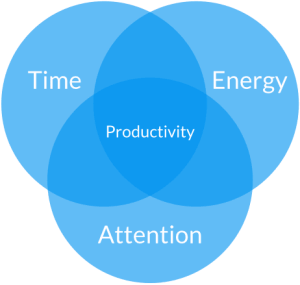 It illustrates three factors which lead to greater productivity. In a manufacturing environment, we constantly measure how productive we are. Can we increase our productivity in a day, in an hour, in a week? The author of the graphic suggests that productivity comes from high energy applied consistently in time with intentional concentration. When those things meet up, greater productivity occurs. It’s a great assessment tool. You can be present and have no energy. Thus your productivity falls. You can apply energy and concentration but run out of time due to poor planning or wrong priorities. You can be working hard and fast, but lack of concentration causes mistakes and setbacks. What’s your assessment of your productivity? Is it where you want it to be? Which of the three factors is keeping you from being effective as you like?